After checking in at Suvarnabhumi Airport, I still had a few hours before my flight. 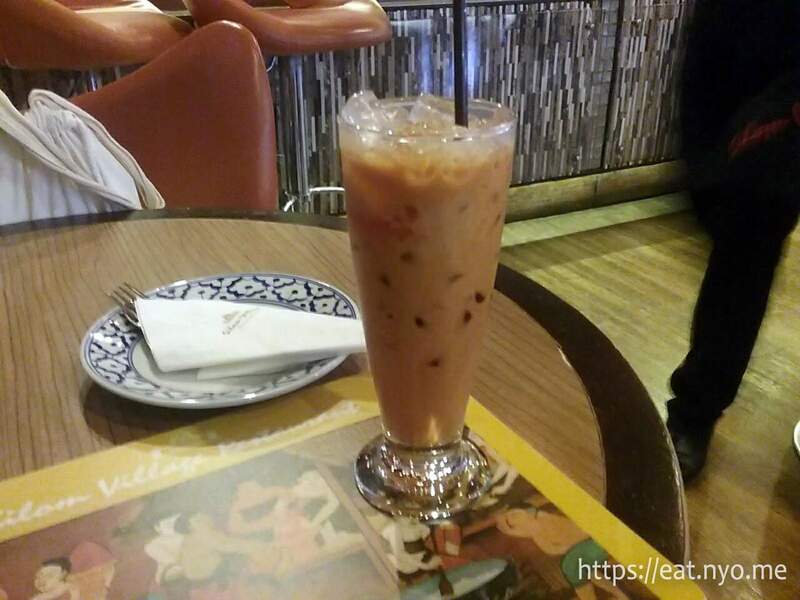 Since it took me around six hours from my last meal at Megabangna until checking in at Suvarnabhumi, I was already a bit famished, especially with all the energy spent lugging around my baggage and the actual process of checking into the airport gates area. Here, I found a Thai restaurant called Silom Village. Since I thought this will be my last meal in Thailand, I reckoned it will be better to order some Thai specialties. 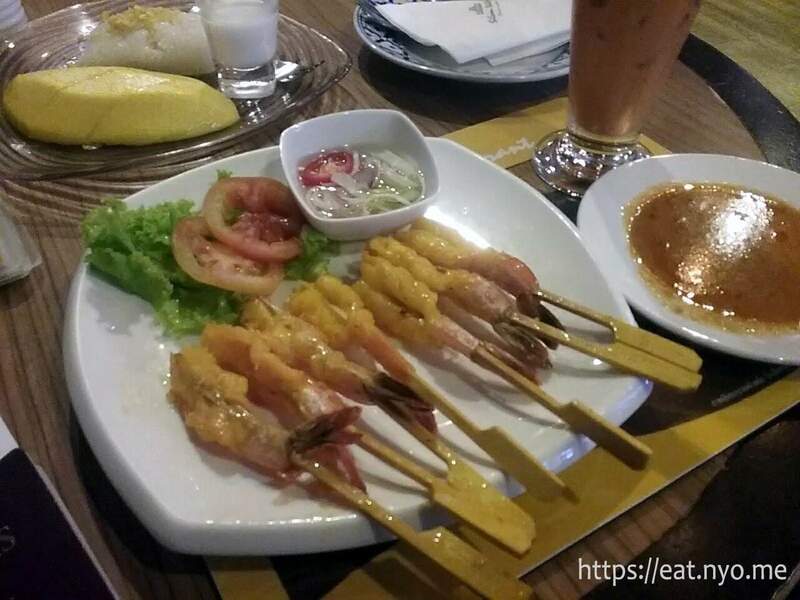 Thus, I ordered one of their more expensive skewers, the Shrimp Satay (270 Baht) as well as the famous Thai dessert Mango Sticky Rice (165 Baht). I already walked around the area and found that these prices are basically what’s competitive within the airport. I also ordered their Thai Iced Tea (128 Baht) to wash it all down. Service was a bit slow, but eventually, I was given my Thai Iced Tea. It tastes like the usual Thai Iced Tea. It’s a bit sweeter than what I drank at Ippudo, but essentially the same, even the amount. The Shrimp Satay was precented nicely with a side of greens and tomatoes and skewered individually, peeled until the tail and colored bright yellow, in signature satay color. It tasted a bit nutty with the expected shrimp scrumptiousness. The size isn’t too big, however, and I felt it could be bigger or could be more especially with the price I paid. The sauces included a slightly sweet vinegar and nutty sauce that are pretty much optional. 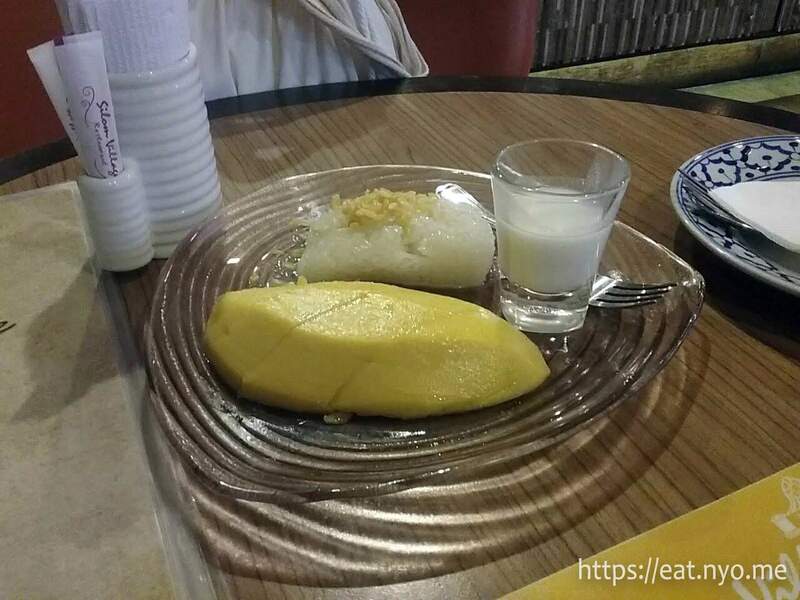 The Mango Sticky Rice was literally a slice of mango with sticky rice with a side of coconut milk. The rice was topped with something crunchy which was the best part of the dish for me. Sadly, the rest of the dish was just too familiar and yet foreign at the same time. I usually have mangoes back home and I’d get the entire mango, and I can have many mangoes. They taste similar, perhaps less sweet. I also prefer the unripe version with bagoong and the ripened ones turned into ice creams or sorbets. As for the sticky rice, it’s just the sweet short-grained rice that we have back home as well, which we turn into various rice cakes or kakanin. I also did not understand how it’s supposed to go well with mangoes; I mean, sweet and sweet just makes it too sweet. Sadly, this dish as a whole just did not jive with me and I did not personally understand the appeal combining these two main items together. Despite having okay food, I can’t really recommend going out of your way to actually eat at Suvarnabhumi Airport’s Silom Village. I think it’s better to eat before checking in or at the convenience stores outside the gate area. What I had was just too expensive compared to what I can get outside the airport gates. Finally, while I get why foreigners might find the appeal in Mango Sticky Rice, I just can’t. I find Philippine mangoes and sticky rice similar, despite us not having a dish like this. I don’t find these two going well together and I’d rather have mangoes on its own or the sticky rice in other forms, particularly our local kakanin. While the satay was good, it wasn’t plenty especially for the amount I paid. The other food choices in the area that, despite not being Thai, seems to provide more sustenance. I suggest getting your Thai food fill outside the airport and stay away from Silom Village, at least inside the gated area of the airport. Not recommended for: Plebian commuters. Smart nomnomnom tip: Expect exuberant airport prices; get your Thai food fill outside Suvarnabhumi.